In War Thunder Update 1.61, Squadron Battles will switch to a full-fledged seasonal system. Read the details in our Developer Diary. We’re presenting an update to squadron battles that are moving to a full-fledged seasonal system. We’ve significantly increased the number of prize-winning places and also made rewards more varied. Now all squadron events are split into seasons, each season lasting 2 months with 6 seasons of squadron battles in total per year. When a season begins, squadron statistics are reset. The system for splitting statistics between Arcade and Realistic battles will remain in place. The majority of season rewards will be awarded at the end of each season, but there will also be rewards that a squadron can receive when they reach a certain position on the leaderboard. A reward of Golden Eagles is provided for the first 20 squadrons on the leaderboard in one of the game modes – Arcade or Realistic battles. The reward for 1st place will be 30,000 Golden Eagles, the reward for 20th place on the leaderboard will be 3,000 Golden Eagles. The distribution of gold rewards within the squadron has also changed: the top 20 players in terms of efficiency will each receive a fixed reward amounting to x0.04 of the prize fund. The remaining members of the squadron will receive the rest of the prize fund, split equally between the squadron’s troops. For example, if the squadron contains 30 members, the top 20 most efficient members will get twice as many Golden Eagles as the remaining 10. New types of rewards have also been added to the rewards of Golden Eagles for the first 20 squadrons on the leaderboard. The top 100 most effective squadrons of the season can obtain the following rewards. Unique decorative clan tags - new clan tag decorations that the top 100 squadrons on the leaderboard will receive. Changing the clan tag decoration is free. The decoration is visible to all players in random battles. The prize clan tag decoration will remain with the squadron until the end of the following season. Unique decals - we’ve prepared a set of fantastic decals for squadrons that lead the season. These decals will be a personal mark of honour which each member of the squadron can proudly wear, to the envy of their teammates and the terror of their enemies. 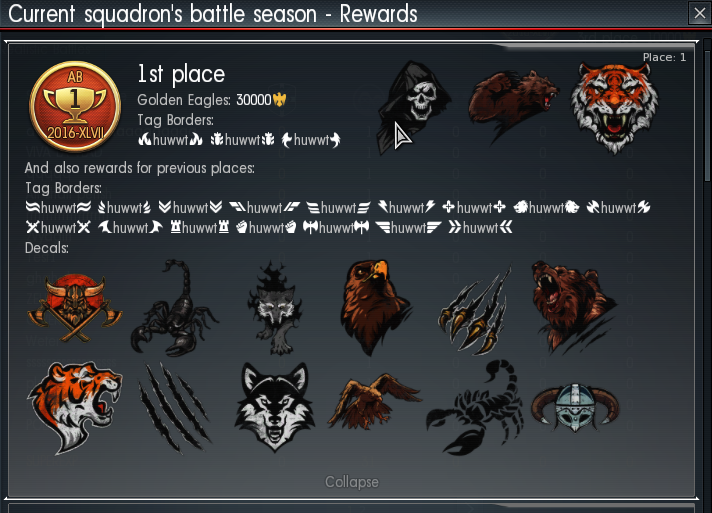 Squadron battle decals will be given out to the top 10 squadrons on the leaderboard, and the leading squadron in the tournament race will get the most decals. Unique decals are available for all squadron troops and will remain with their owners until the end of the following season, in which they will have to be fought for again. Regalia - the first 100 squadrons in the seasonal leaderboard will be given a special reward, regalia. Regalia is a mark in the squadron profile and the player profile which shows the season and the squadron’s position in the season. Regalia remains with the player forever, even if the player leaves the squadron. 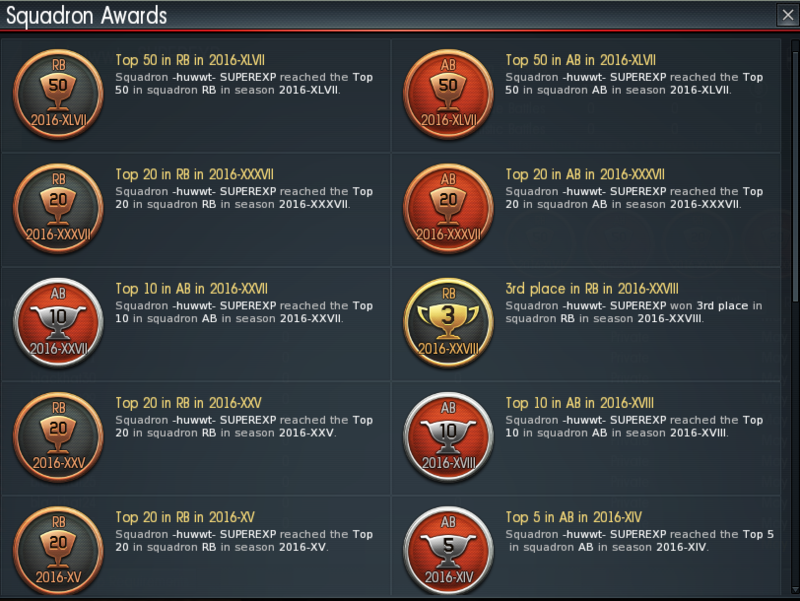 For each season, unique regalia will be awarded, so the collection of regalia in the profile of each player will be a true sign of mastery in War Thunder. Attention, to receive the squadron awards, the player must receive scores in their personal squadron rating. If a player joins a squadron that won prizes in the previous season, he wont receive any rewards, since they are given when the season ends. If he changes squadron he will receive rewards depending on which squadron he is in at the end of the season. Commanders, prepare for the first season of squadron battles in War Thunder. Fortune favours the bold on the Road to Glory! plyz remove hit camera from simulator. make global map and add simulator squadron battles!!! lyrillvempos1327, just checked wiki, is this ab squad battle thing going on for 6 hours daily?? ?so all i do is go check in game squad list and apply for top squads? That would be pretty hard lol. So there is hope for this game after all. Thank you.